The U.S. Shale Oil Industry utilizes a stunning amount of equipment and consumes a massive amount of materials to produce more than half of the country's oil production. One of the vital materials used in the production of shale oil is frac sand. The amount of frac sand used in the shale oil business has skyrocketed by more than 10 times since the industry took off in 2007. According to the data by Rockproducts.com and IHS Markit, frac sand consumption by the U.S. shale oil and gas industry increased from 10 billion pounds a year in 2007 to over 120 billion pounds in 2017. This year, frac sand consumption is forecasted to climb to over 135 billion pounds, with the country's largest shale field, the Permian, accounting for 37% of the total at 50 billion pounds. 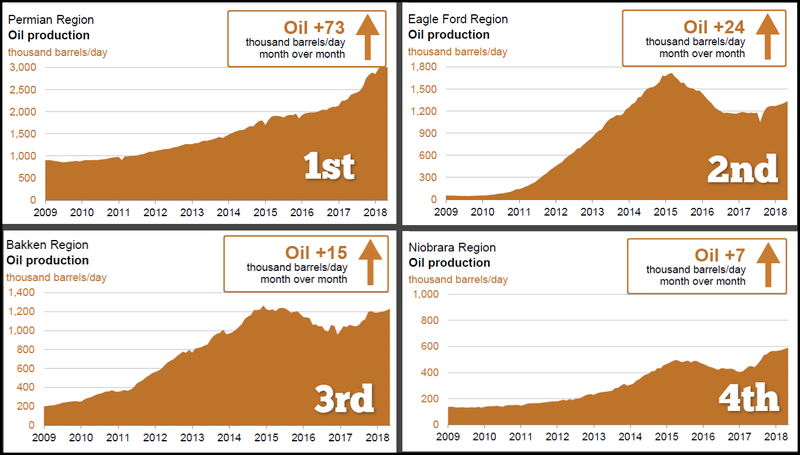 As we can see in the graph above, the Permian Region is the largest shale oil field in the United States with over 3 million barrels per day (mbd) of production compared to 1.7 mbd in the Eagle Ford, 1.2 mbd at the Bakken and nearly 600,000 barrels per day in the Niobrara. However, only about 2 mbd of the Permian's total production is from horizontal shale oil fracking. The remainder is from conventional oil production. 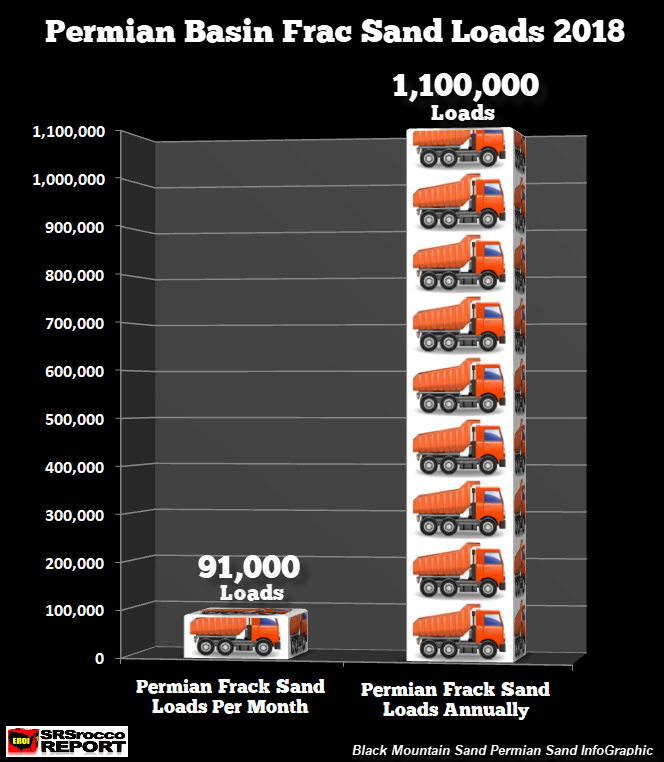 Each month, over 91,000 truckloads of frac sand will be delivered to the Permian shale oil wells. However, by the end of 2018, over 1.1 million truckloads of frac sand will be used to produce the Permian's shale oil and gas. I don't believe investors realize just how much 1.1 million truckloads represents until we compare it to the largest retailer in the United States. According to Walmart, their drivers travel approximately 700 million miles per year to deliver products from the 160 distribution centers to thousands of stores across the country. From the information, I obtained at MWPWL International on Walmart's distribution supply chain, the average one-way distance to its Walmart stores is about 130 miles. By dividing the annual 700 million miles traveled by Walmart drivers by the average 130-mile trip, the company will utilize approximately 5.5 million truckloads to deliver its products to all of its stores in 2018. 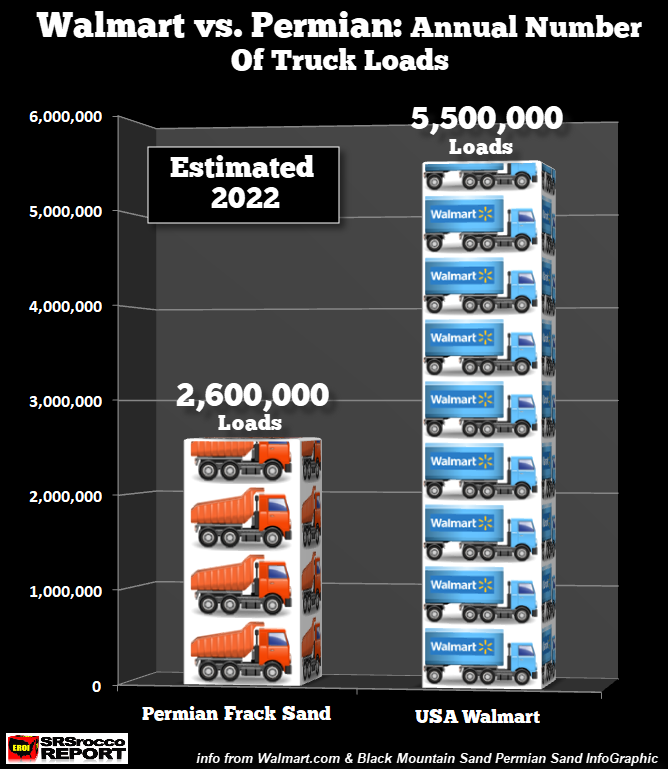 This is an insane number of truckloads just to deliver sand to produce shale oil and gas in the Permian. Unfortunately, I don't believe the Permian will be consuming this much frac sand by 2022. As I have stated in several articles and interviews, I see a massive deflationary spiral taking place in the markets over the next 2-4 years. This will cause the oil price to fall back much lower, possibly to $30 once again. Thus, drilling activity will collapse in the shale oil and gas industry, reducing the need for frac sand.